Regarding modern factory equipment, efficiency and ergonomics should be mentioned in the same breath as an ergonomically designed workplace is worth real money. Studies in industry and trade impressively show the positive effect of ergonomically designed workplaces on the economic success of the company and the job satisfaction of the employees. Reduce fatigue and increase your productivity. Provide additional security at the workplace, and avoiding Sie so accidents. Increase job satisfaction, i.e. higher performance. 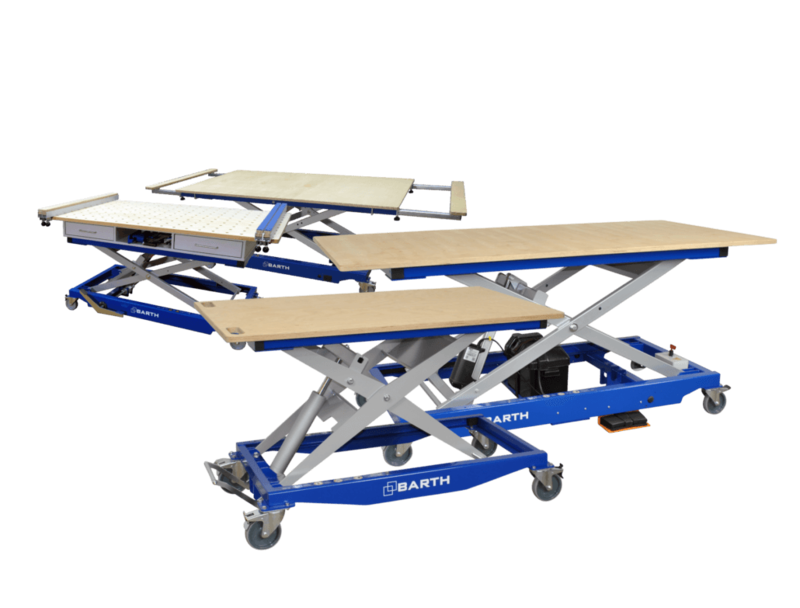 When developing the modern workplace systems such as lifting tables and work tables, Barth has put these ideas into practice for the workshops of carpenters and interior designers. Ergonomic working is not only economic. The lifting tables have a solid base frame which reliably supports workpieces up to 500 kg depending on the model. Our lifting tables have been developed for practical use and can be quickly adjusted to the desired height. Depending on the model, the tables are height-adjustable by foot pump, electrical or battery-operated unit. A work table that follows the workpieces to any place in the workshop.